Steven (Chicagoland, United States) on 8 June 2011 in Art & Design and Portfolio. TRADITIO LEGIS, (The Legal Tradition), 1906. Designed and made by F. X. Zettler of Munich, Germany. From St. Agatha Church, 3151 W. Douglas Blvd. Chicago. Stained and heavily painted cathedral glass. The compositions and painting technique developed by F. Mayer and F. X. Zettler both of Munich, Germany and the Tyrol Art Glass Co. Innsbruck, Austria (Tyroler Glasmalerei und Mosaik Anstalt, known as TGA) became known collectively as the Munich Style and had many North American followers. The scene depicts the popular version of the traditio legis, Latin for legal tradition, of the founding of the Catholic Church by St. Peter in Rome, Italy. Originally St. Peter was called Simon, but Jesus gave him the Aramaic title of Kepha (John I, 42), meaning 'rock', of which the Greek equivalent become Peter in English. The title was explained when, in reply to Simon's declaration 'Thou art the Christ, the Son of the living God', Jesus said to him, 'Thou art Peter, and upon this rock I will build my church,' and conferred upon him 'the keys of the kingdom of Heaven' and the power of 'binding and loosing' afterwards extended to the other apostles (Matt. Xvi, 16-19; xviii,18). Thus this composition showing St. Peter kneeling before the standing Jesus who holds a key in His left hand and raises His right. Three apostles observe the event. The Church of St. Peter (the church of the Vatican, Rome, Italy) is shown in the background on a rock/mountain behind in a ring of clouds, within a Romanesque Revival vine frame. St. Agatha Church was founded in 1893 to serve Irish families who had moved into the Lawndale area near Douglas Park on the west-side of Chicago. To meet the needs of a growing congregation, ground was broken October 1903 for a new church designed by the Chicago architectural firm of Prindiville and Egan. The cornerstone was placed on June 26, 1904. Two years later, on May 27, 1906, the official dedication was presided over by Archbishop James E. Quigley of Chicago and Archbishop John Glennon of St. Louis. 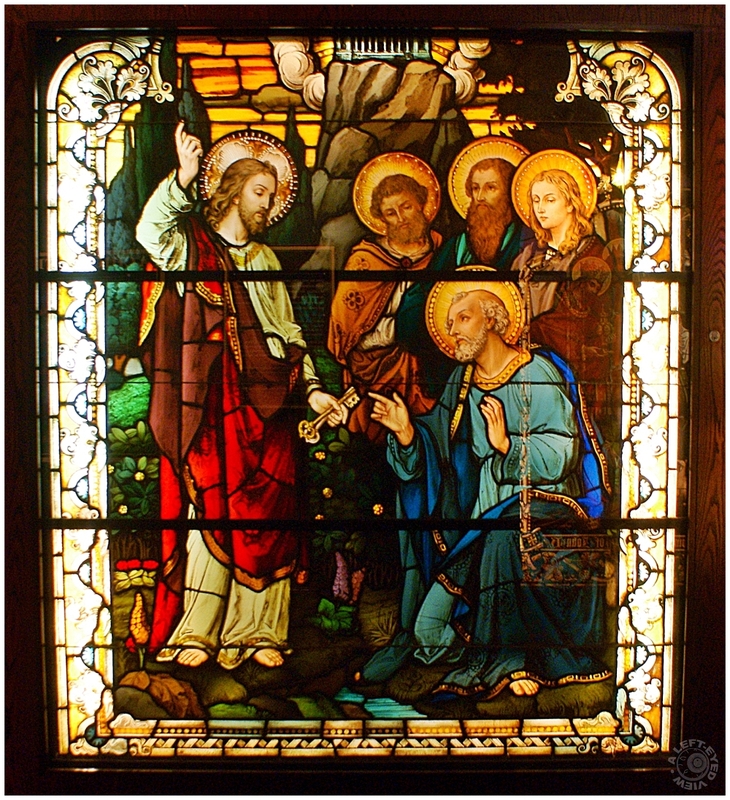 This stained glass window was donated by the Edward Byron Smith, Jr. Family to The Chicago Historical Society and is on loan to the Smith Museum of Stained Glass Windows and American Art at Navy Pier. these glass-paintings are so beautiful. Nice capture and warm colors. Apologies for my lack of presence on Aminus3 yesterday and today as my internet service at home is down. AARRGGHH!!! I was curious about the keys, thinking keys had not yet been invented during this time but a quick search and indeed the key had been in existence for 1000 years during that time. it must be an amazing museum with all this so impressive handicrafts! I would love to go to this museum; thanks for letting us in on its existence, and for the background on this particular window. Stained glass is not a slam-dunk to photograph well. You have a nice photo here; very sharp and clear, with excellent light and colors. Nice. Nice. Nice. Superb photo. Your lighting and your colors are very beautiful. Excellent work Steven. Amicalement Antoine. Very good view of this window, which is quite difficult to photograph this well. A perfect example of painting on the window which is amazing in its execution. Gorgeous color and perspective in this work of yours. Beautiful work. It must be a photographers dream in the museum. A true Bavarian window! I love this!